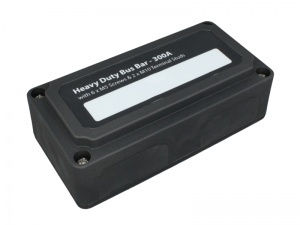 A superbly designed and constructed 300A busbar terminal box. 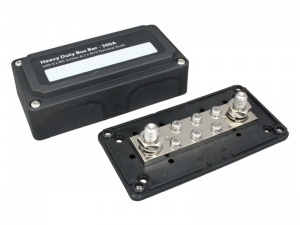 This heavy duty enclosure is extremely rugged and well protected and contains a busbar with six 5mm screw terminals for power distribution and two 10mm stud terminals for the main power connections. 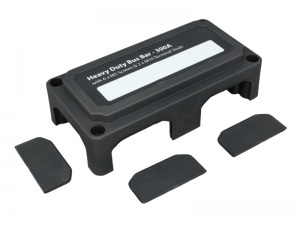 The lid of the housing features six slide-out panels that provide multiple cable entry options and it can be mounted through the 4 holes in the base using the self-tapping screws supplied. 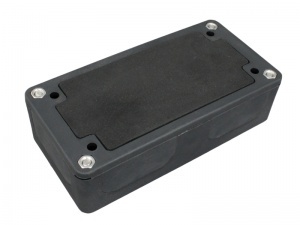 The is also a foam anti-vibration pad on the base of the box to reduce un-wanted noise. 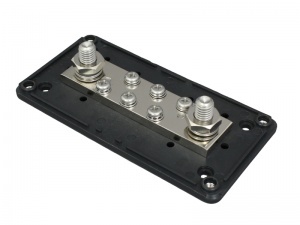 All terminals are stainless steel with anti-vibration locking washers and the busbars are solid copper with a tin plate. Suitable for use in cars, boats, motorhomes, caravans, campervans, commercial vehicles etc.